Description: The #715 Peter Bunny Engine was introduced in 1941 and made until 1944, but it was revised again in 1948. In 1949, a new Bunny Engine, the #721 Peter Bunny Engine, took it's place. In 1954 a third and final Bunny Engine was introduced as the #703. FPT8272 - Rectangular wooden train engine with a round fiber boiler with a metal end on the front and a wooden engine cab and coal tender cart on the back. The boiler has a brown wood-simulated paper lithograph on the sides, a black wooden bead on the top front, and a large metal bell on the top back. 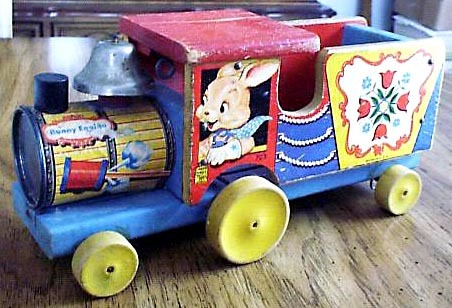 The cab has a yellow wooden roof and paper lithograph pictures of a Bunny engineer on the side hanging out of the cab window. The side of the coal car has a blue and yellow paper lithograph with a picture of 4 red flowers, 4 blue flowers, and green leaves in the center. The bell on top of the boiler rings as the toy is pulled. 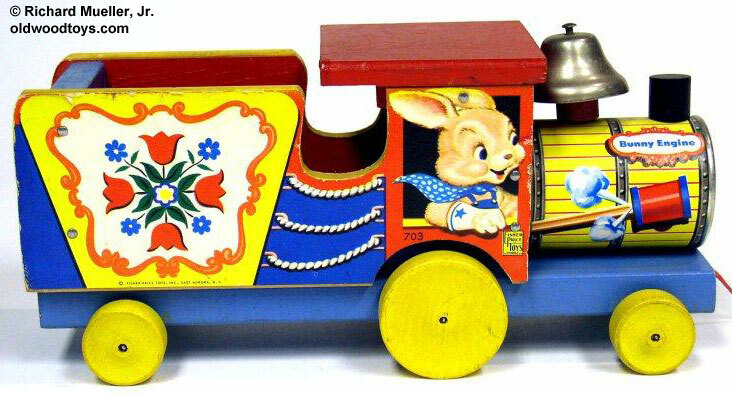 This toy rolls on 6 wooden wheels, 2 small wheels in the front (under the boiler), 2 small wheels in the back (under the cart) and 2 larger wheels in the middle (under the cab). Measures 10-1/4" long. This toy was sold only during the Easter season. Also see 1941's #715 Peter Bunny Engine and 1949's #721 Peter Bunny Engine.